The English Cities Fund has announced that it has let 157,000 sq ft at New Bailey, to HM Revenue and Customs (HMRC). HMRC will relocate to the third office development at New Bailey, taking the entire building on a 25-year lease. The English Cities Fund is a joint venture between Muse Developments, Legal & General and Homes England. Salford City Mayor, Paul Dennett, said: “Securing HMRC is a major coup for the New Bailey scheme and for Salford as a whole. It confirms the city as a prime location for forward thinking businesses that want the combination of great connections and high-quality accommodation on offer. Chris Mulcahy, director of office agency at JLL, who advised HMRC, said: “We undertook an extensive search taking in to account wide ranging factors including cost efficiency. It was testament to the quality office schemes put forward by experienced developers that such a broad range of well-located sites were considered. New Bailey was chosen largely for its accessibility, deliverability, being close to Salford Central and on the doorstep of a variety of amenity. 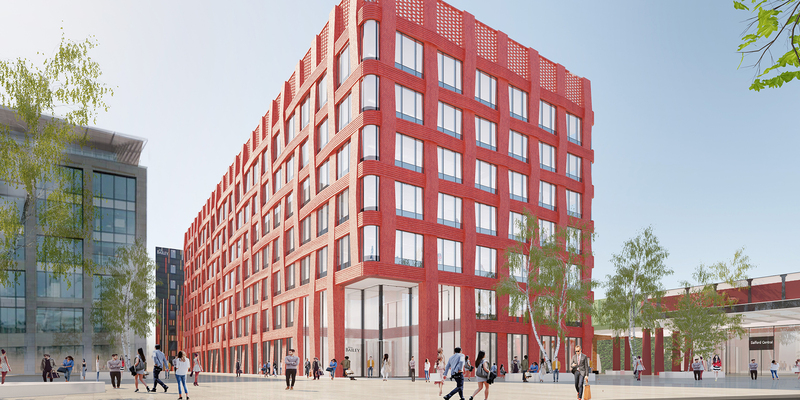 The BREEAM ‘Excellent’ building will be situated on New Bailey Street, immediately adjacent to Salford Central station and will front a large new area of high quality public realm. It will comprise of the ground floor and six storeys. The scheme is due to start on site in early 2019, with completion due in early 2021. The English Cities Fund’s first office scheme, One New Bailey, is now complete and home to high profile businesses, including Freshfields Bruckhaus Deringer and WHIreland, whilst Two New Bailey Square is on site and due for completion by the end of 2019. JLL and Cushman and Wakefield are joint letting agents for the New Bailey scheme.